I was one of those people who actually liked the concept of IC2 crops, however I did not like the way it was implemented (completely Random). I am also one of those people who completely removed IC2 from his modpack in favor of Mekanism. I am also one of those people who likes HarvestCraft. So then this idea appeared; imagine IC2 crops, with a breedling line like Forestry bees/trees but with the HarvestCraft crops. Unfortunatly I had not a single clue how to mod Minecraft, after running around with this idea for some time, I decided to learn how to mod Minecraft using Forge, and Agricraft is the result of that. Agricraft aims to implement IC2 crops mutations for every crop out there, using the configs it should be possible to configure any mutation from any mod you want while also adding some farming equipment. 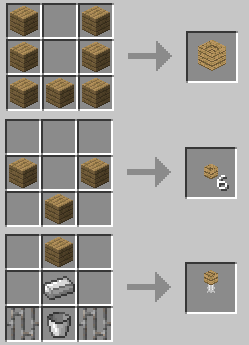 It should also be possible to plant and harvest any seed from any mod on AgriCraft crops (one known exception is infused seeds from Thaumic Tinkerer). Mutations are the core mechanic of this mod. 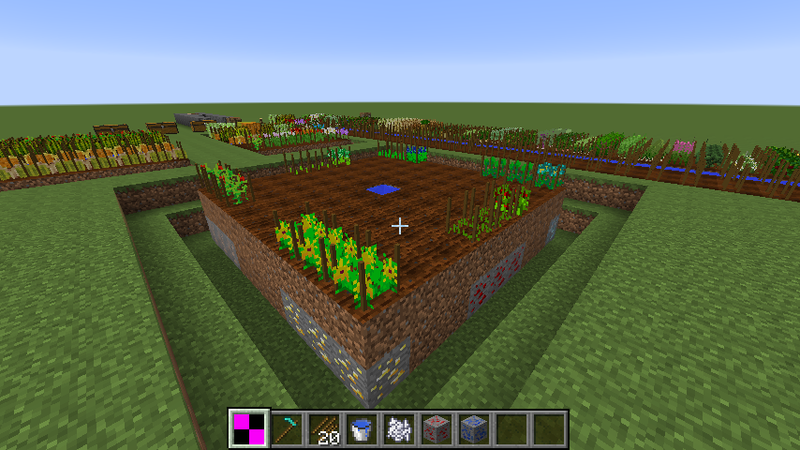 To mutate plants into other plants you first need to put some crops on farmland. If you apply crops to existing crops it will make it into a crosscrop. The more fully grown plants planted on crops next to a crosscrop the sooner a mutation will occur, mutations are actually crossbreeding of crops. If there are at least 2 fully grown crops next to a crosscrop, a mutation can sprout on the crosscrop. This mutation is either one of the surrounding crops or a brand new one. Also the stats of the crop (growth, gain and strength) can increase (the more crops around a crosscrop, the higher the chance of stats increasing). Check surrounding crops and find possible mutations (specified in the configs, see later). At random, one of the found mutations is chosen (if there are no compatible mutations found, nothing happens). If the resulting mutation cannot grow on this spot, the plant will not sprout (for example, some plants require a base of a certain block, or another block near them). If the spot is favorable for the plant to grow, the mutation has a certain chance to sprout (depending on it's tier, the higher the tier, the lower the chance). You will see a new plant growing if the mutation was successful and new stats will be inherited based on the surrounding crops. At random one of the surrounding plants is chosen to sprout on the crosscrop. Just as with mutations, the spot has to be favorable for the plant to grow, else nothing will happen. Then the possible new plant has a chance to actually sprout, also depending on the tier. (these chances can be overridden in the configs, for example to balance out certain mods like Magical Crops). If everything went right you will see a new plant sprouting with new inherited stats. Mutations have changed from 1.7.10 to 1.10.2! Mutations are now controlled by AgriMutation files, which are JSON descriptions of the conditions, chances, and products of a mutation. These new files are located in the AgriCraft configuration directory, where they can be easily copied and/or modified on a per-game basis. The crown jewel of the 1.10.2 update is the introduction of the JSON AgriPlant format, located in the same directory as the AgriMutation files. These are flexible plant descriptions for all plants that can be grown in crops, with no exceptions. This means that the user has 100% control over the plants in your game! You can even customize the weeds (evil laughter)! Notice, mutations & plants will sync from the server, so server owners, you have full control over AgriCraft (no need trying to get users to manually download config files, we do it for you)! In the /config directory you will find an agricraft folder containing a configuration file and a mutations file. The mutations file contains default mutations based upon what mods you enabled integration for in the configuration file (if you enabled mod integration for mods that aren't installed, it will not generate the defaults for those mods). If you wish to reload the default mutations, there is also a config option for that. 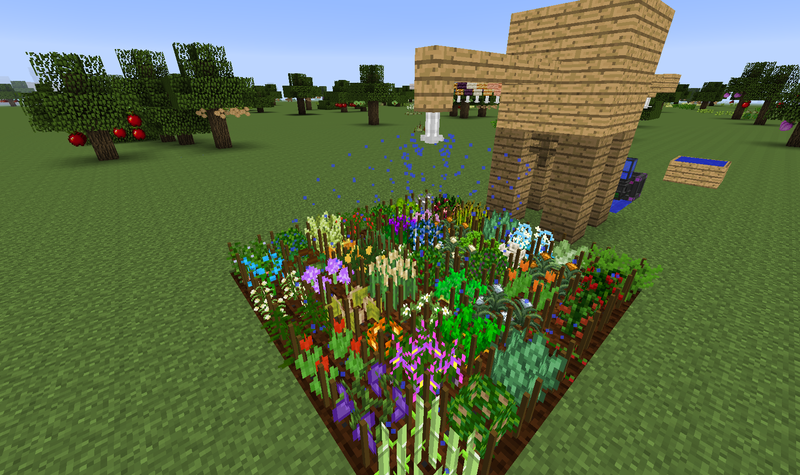 Currently there are default mutations for: Vanilla, AgriCraft, Pam's Harvestcraft, Natura, Plant Mega Pack and Pam's Weee Flowers. When you launch MineCraft, AgriCraft should ouput all registered mutations to the log. If you defined a name wrong you will see "null" in the mutations (example: "harvestcraft:cornseedItem = null + minecraft:seeds_wheat"). This config file also contains instructions on how to specify these mutations or advanced mutations. 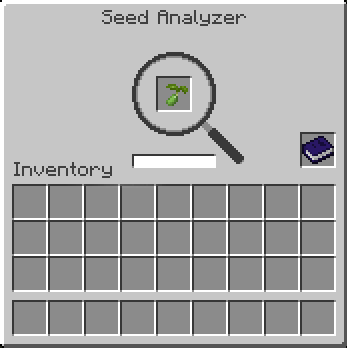 Next, put your journal in the dedicated slot in the seed analyzer. Now every seed you analyze will be written down in your journal. You can read information, the tier, growth stages, fruits and if you have discovered all the seeds required for a mutation (parent seed 1 + parent seed 2 = mutation) the mutations as well. Irrigation systems consist of 3 components: the tanks for gathering/buffering the water, the channels for transporting the water and the sprinklers for actually irrigating the land. The tanks and the channels can be crafted with any wood, however all the planks have to be the same material. The tank and the channel will look like the wood used to craft them. Tanks are multiblocks and will connect to other tanks placed next to them, tanks and channels only connect to other tanks and channels if they are made of the same material. Tanks are filled when it is raining, additionally you can also use other mods to pump water in them. Next an irrigation channel has to built from your tank to the spot you wish to irrigate. If the waterlevel in the tank is higher then the level in the channel, water will flow from the tank to the channel and vice versa. You can then attach sprinklers on irrigation channels, these will irrigate the farmland (you no longer need a water source nearby) and will speed up the growth of plants. If you don't like irrigation systems you can disable this in the config. To maximize the synergy with other mods, there is a config file to blacklist seeds from being planted on crops as well as a config to override spreading chances for seeds (these files contain instructions how to do this). You can also add in your own crops, first set the option to create custom crops to true in the main config. 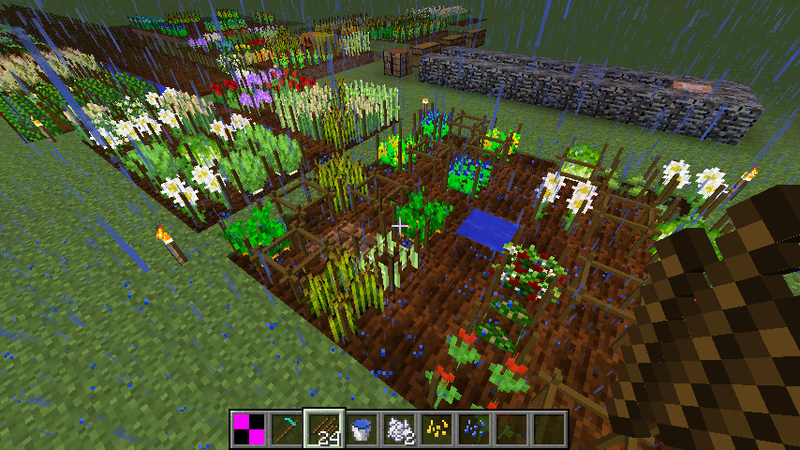 Next the mod will generate a new file where you can specify your custom crops. This file also has instructions on how to specify the crops. 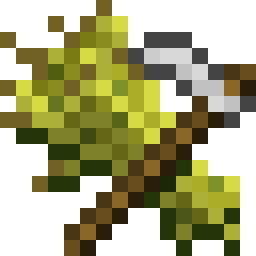 Next this mod has support for the MineFactory Reloaded harvester and Thaumcraft harvesting golems. Meaning you can automate the harvesting of crops. 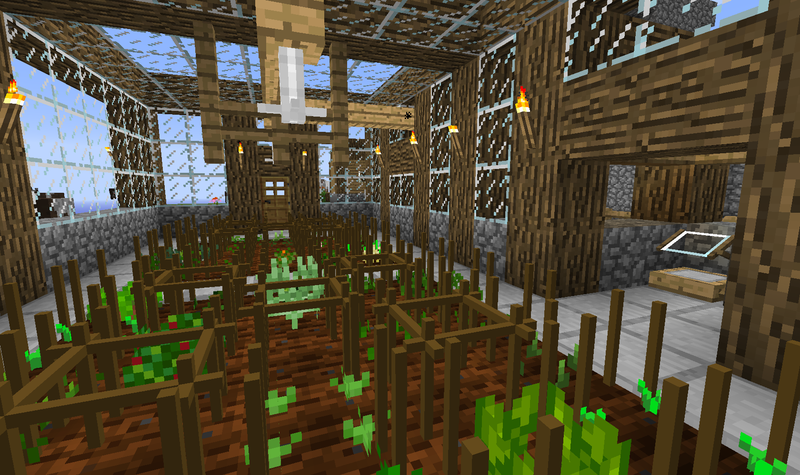 AgriCraft also has some world gen: it will generate greenhouses in villages containing random crops (as can be seen in the screenshots). Finally the mod also provides some resource crops, these generate resources (gold nuggets, redstone dust, ...). In order for these plants to grow, they need a base of the corresponding ore (as seen in the screenshots). 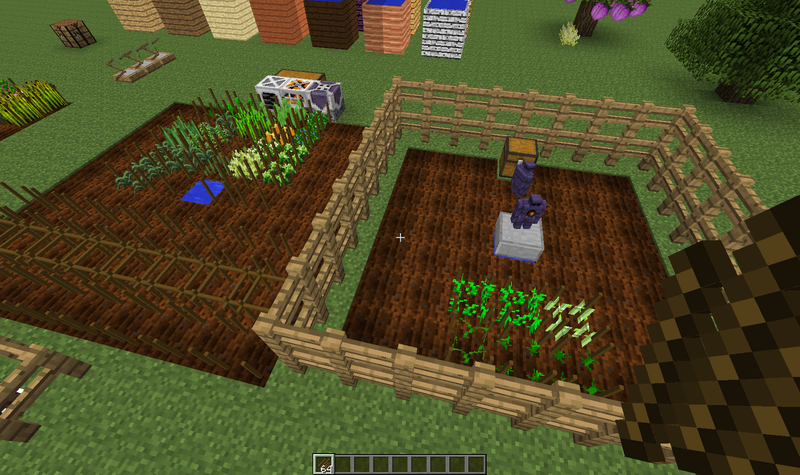 When AgriCraft detects other mods that add metals (aluminum, tin, copper, lead, ...) it will also add in crops for that. Both these features (greenhouses and resource crops) can be disabled in the config. -CHANGE: Overhauled the way mutation requirements work: instead of setting specific requirements for mutations, you now have to set specific requirements for growing. -Added Minetweaker support for various aspects of AgriCraft. Check the GitHub wiki for documentation. How did you obtain those seeds? I plant seeds on top of ores and can't seem to get them. Does this work with the canola crop from rotarycraft? Wow! You, sir, are amazing. This is your first mod? Wow! Super excited this is not IC2 and is Harvestcraft -- I totally agree about IC2 meh and Harvestcraft whee! Loving the new channel valves! I wish you could open and close them by shift right clicking on them the levers connect and look nice on them. I think he is asking how do you cross breed seeds to get the resource seeds. I have players that want to know the same thing. We can find the seeds in villages, but attempts to create a mutation have failed. Tried a number of different types of seeds with the appropriate ore blocks buried underneath and it just doesn't mutate. That was it. It's probably I enabled resource crops after I started the server, and the new settings didn't make it into the mutation file. Is there a reason it isn't on as a default to match what IC2 does? Because some people may have overwritten all the mutations with their own, adn updating the mod would then wipe them all out. Yes! I love this. This + Hunger Overhaul seems like a great combination.